In 2015-2018, Latvian courts received seven criminal cases regarding residents’ possible cooperation with KGB. Five of those cases have been reviewed so far, and no cooperation was proved in in any of them, as reported by Latvian Court Administration. One case was received in 2015, two more in 2017, and four in 2018. Two of the last four cases have been successfully reviewed. The ruling of the last reviewed case came to force on 27 November. It is noted in the available text of the ruling that the person had been recruited in the agent category and that is no information available on the person’s exclusion from the agent database. However, Centre for the Documentation of the Consequences of Totalitarianism found no agent reports mentioning the person. The prosecutor responsible for the case also noted that no evidence was found during the pre-trial investigation to prove the fact of the person being an informer for KGB in the true definition of the law. The person in question did not admit cooperating with KGB, reporting any information to KGB or performing any orders, adding that he was never given any. He testified that he did not know about being added to the KGB agents database, stressing that he had minimal contact with KGB workers. As an example he mentioned the time when he served in the army and KGB workers offered him becoming an officer. He said he refused this offer. The next time he contacted with KGB was when a robbery took place at his workplace and KGB officers asked him to write a report. In 1983, he was contacted by some KGB representative who asked him different questions. Another person testified in this criminal case. This person said he had no idea about a KGB agent card being made for him, stressing that he had never signed any documents regarding cooperation with KGB. The court concluded in the ruling that no decisive evidence was provided to prove the fact of cooperation with KGB. Which is why, the court concluded the person in question cannot be considered a KGB informer. As it is known, some of the KGB documents were published on kgb.arhivi.lv on 20 December. 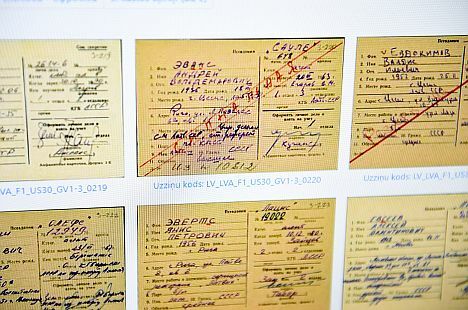 Since the publication, several people have turned to court intent on proving the fact they did not cooperate with KGB, as previously reported by Court Administration representative Ināra Makārova. She said ‘a considerable number’ of residents have turned to courts, hoping to prove they did not cooperate with KGB. However, courts cannot do this on their own, because residents have to turn to the prosecutor’s office first. Prosecutor General’s Office Public Relations specialist Una Rēķe says the office has yet to receive a single request of this nature. The law states that the prosecutor’s office is to investigate cases associated with residents’ possible cooperation with KGB only once a request has been received and is to commence the investigation no later than five days after receiving the request. The term for pre-trial investigation is two months. This term can be extended to six months for special cases. If the prosecutor in charge of the case concludes the investigated person did, in fact, cooperate with KGB, he writes a report. The prosecutor needs to find out if the person’s cooperation with KGB was intentional or unintentional. After that, the prosecutor presents the report to the person. Viewings of such cases in court are held in the same manner as other criminal cases.